A fun day of learning for Downbelow staff Revor Anson as PADI Instructor Mel brought him to his first Rescue Diver course session as part of his year-long internship that will see him qualified as a professional PADI Divemaster. Both of them were joined by the Go Pro interns as they refresh their rescue skills in preparation for their PADI IDC Malaysia starting in a few weeks’ time. While the learning is fun, the subject is serious as rescue divers learn to look beyond themselves and consider the safety and well being of other divers. This course is challenging but it builds your confidence, knowledge and experience as a diver. With all of the interns coming together for this course, they worked together as a team covering a variety of scenarios, making it an enjoyable time for everyone! Boost your diving confidence today! Entry requirements for the PADI Rescue Diver course are you must be a PADI Advanced Open Water Diver or have a qualifying certification from another training organization and have successfully completed a sanctioned course in primary care CPR and secondary care first aid within the past two years. 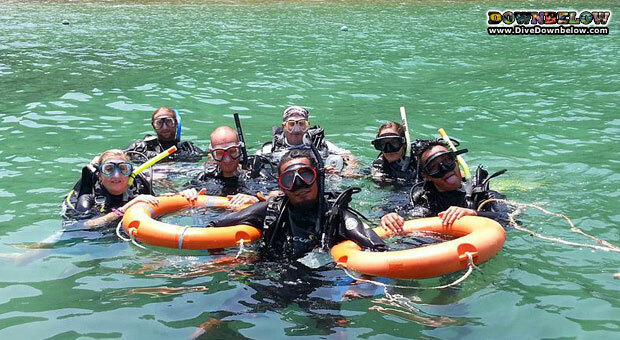 Read more about our PADI Rescue Diver Scuba Course or contact us for details!